Visit us in store and take an #ElfieSelfie to win a £100 Tesco Gift Card. Here are the competition conditions! 1) Pull your best Christmas face in an Elfie Selfie standee found in any BrightHouse store! 3) Include the hashtag #ElfieSelfie in your post. *#ElfieSelfie contest runs until 13th December. Entrants must be aged 18 or over. The winner will be picked at random and notified on 14th December. - Entrants must take a photo of themselves in one of the Elfie Selfie standees situated in any BrightHouse store. 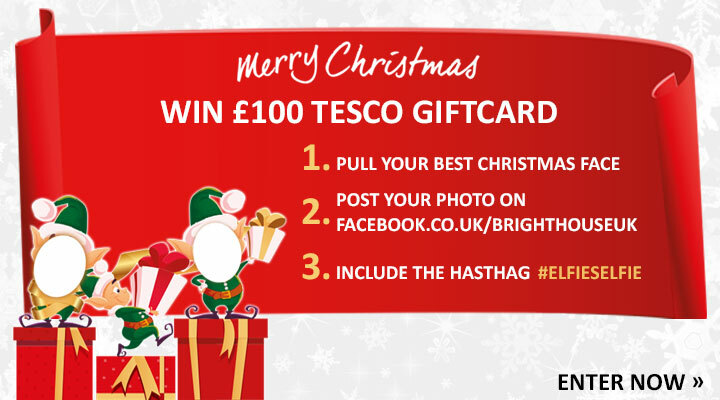 - Entrants must upload their Elfie Selfie photo to the BrightHouse UK Facebook page via a public post. - Entrants must include the hashtag #ElfieSelfie anywhere on the same post. Prize draw valid from 5/11/18 at 09:00am. The closing date for all entries is 13/12/18 at 11:59 pm (BST). The winner will be randomly selected from all of the photo entries after the closing date and notified via Facebook by BrightHouse on 14/12/18. The prize is a Tesco Voucher totalling £100. The number of vouchers which will be issued are 1 x £10 High Street Voucher. The vouchers will be posted out within 7 days of the winner confirming their address details. By entering this competition, the entrants agree to their photos being displayed in the Elfie Selfie photo album found on the BrightHouseUK Facebook page. Entrants also agree to their photos being shared in BrightHouseUK Facebook posts promoting the Elfie Selfie competition. The winners consent to publication of their first names on the BrightHouse website, Facebook page . No other information is used for marketing purposes. If the prize is not claimed within 14 days we reserve the right to redraw. In the event of a redraw, this will take place on the 29/12/18.